This is an amazing exhibit that takes you through the lifecycle journey of the butterfly. So many species are represented! They have a butterfly hatchery with several crysalis covered trays that were hatching real butterflies as we watched! 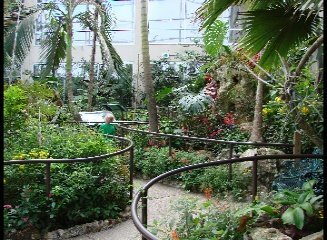 The highlight of the exhibit is the huge outdoor screen enclosed atrium greenhouse filled with wonderful Bromeliads and all kinds of favorite butterfly flowers. There are several waterfalls, with koi in the water, finches flying about, and hundreds of butterflies, resting, eating, flying, and living. They have butterfly releases on Saturdays and Sundays at 2 p.m., 3 p.m. and 4 p.m., weather permitting. Also, in the same building is the Florida Museum of Natural Science, so you can visit next door for free!